As an administrator, when using Google Drive with the AODocs Smartbar extension, you can restore or permanently delete AODocs files. Learn more: Manage deleted documents and folders. 1. Open the library folder in Google Drive. 2. Open the More search menu and select Search in current library trash. 3. The list of files in your current library’s trash is displayed. You can view the files but you can't edit them. Note: You can filter the files in the trash by entering keywords in the search bar before selecting Search in current library trash. 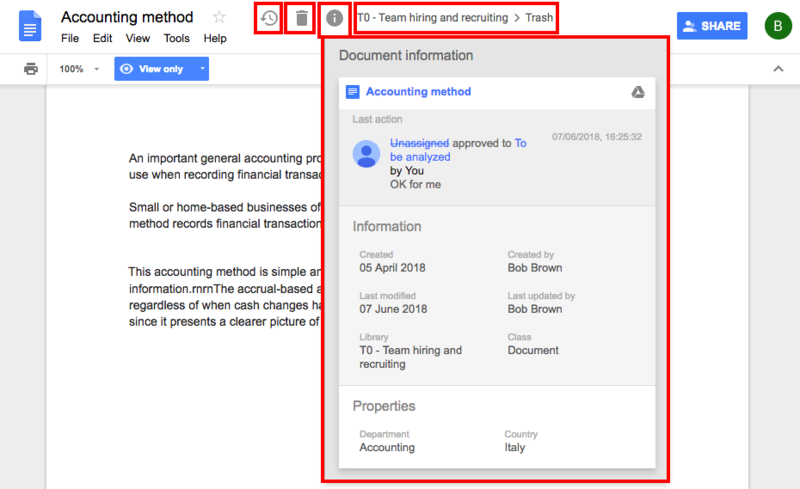 Learn more: Search for files in your Team Folders and Secured Folders in Google Drive. Note: You can't view folders in your current library's trash. To restore or permanently delete folders, use the AODocs library administration interface. Learn more: Manage deleted documents and folders. 1. To restore a deleted file, press the Restore AODocs file button. After a few moments, the file is moved back to its original location. Its permissions are restored and it is accessible again to library users. 2. To remove a file permanently from the trash, press the Permanently delete AODocs file button. Note: By default, documents are retained in the trash for a period of 30 days, after which they are permanently deleted. This can be disabled. Learn more: Manage the retention time of deleted files. Note: You can restore or permanently delete only Google Docs, Sheets and Slides from the Google editor. Is it possible to disable the permanently delete option? As an organization, we are concerned about users permanently deleting items. Therefore, we allow users to delete with the safety net of reviewing deleted files and restoring them from the admin. It appears with this "enhancement" that any user with delete privileges can permanently delete any file and it cannot be retrieved. Is that correct? This new feature is available for administrators only, like in the AODocs UI. Users with delete privileges can move the files into the trash but can't restore or permanently delete them, only the administrators of the library can do so. It's not possible today to prevent administrators to permanently delete files. If you think that this feature could be interesting for you, I invite you to post a feature request on our dedicated community.